The Douglas A-1 (formerly AD) Skyraider was an American single-seat attack aircraft that saw service between the 1950s and early 1970s. 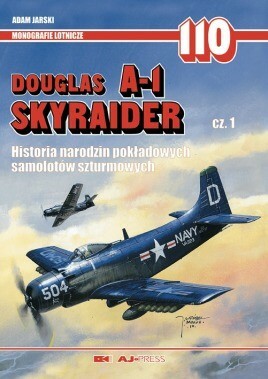 This is the first of two books focusing on the Skyraider attack plane, used by US Navy, as well as US Army Air Force. It begins with the story of difficulties on the road to attack plane construction during the war. Several designs are described - dive bombers, scout planes and torpedo aircraft, which did not enter mass production or were manufactured in short series. Then the story of Skyraider birth follows; it is illustrated with memoirs of Ed Heinemann, the main designer of the aircraft. All versions of the plane are described in detail. The last chapter is the extensive technical description, full of photos and drawings from the aircraft's manuals. The book contains an insert showing scale plans and the other, presenting colour silhouettes. This series is published in Polish with English photo captions, and presents the most popular, most interesting and the best aircraft design of the 20th century. Every monograph describes particular airplanes in a complex way- it contains a history of its development, its historical background and manufacturing history, combat use, camouflage and markings and a detailed technical description. Complemented by hundreds of historical photographs illustrating the subject, plans in modelling scales, and colour profiles depicting the airframes of different times and units, Monografie Lotnicze are a rich source of knowledge, not only for readers interested in aviation history, but also for modellers.